Last year at this time, archaeology doctoral student Becca Peixotto was making international headlines. She had played a critical role in excavating the fossils of a new human relative named Homo naledi. The discovery, deep in a cave in South Africa, was heralded across the world and is expected to change the way scientists think about human origins. Now Peixotto is recovering artifacts from one of the greatest covert migrations in American history—thousands of African Americans who escaped from slavery and lived secretly in North Carolina and Virginia’s Great Dismal Swamp until the end of the Civil War. These former slaves and their descendants are known as maroons. The Great Dismal Swamp is still a large, wild place, filled with wetlands and vine-covered islands, as well as 200 species of songbirds, bears, poisonous snakes, and biting insects. But before modern development, it was once much bigger and wilder —more than one million swampy acres, with vegetation so thick that it was nearly impassable. It was an inhospitable and dangerous place. It was also a perfect place for people who didn’t want to be found. This is why so many fugitive slaves fled there. From 1660 through 1860, they built secret settlements on islands within the swamp, hidden from the outside world and safe from slave hunters. Peixotto and College of Arts and Sciences students Ella Beaudoin (BA anthropology ’17) and Emily Duncan (BA anthropology ’18) are working to help recover their story. Peixotto began this work five years ago with AU Assistant Anthropology Professor and Department Chair Dan Sayers, the first archaeologist to excavate the interior of the Great Dismal Swamp. Until Sayers began his work in 2004, the Great Dismal Swamp and the story of the maroons had been almost entirely undocumented. Peixotto is focused on finding evidence of maroon communities in northern areas of the swamp. Earlier this year she identified possible sites. On one promising island several miles into the swamp, she conducted soil testing and shovel tests. And now she is collecting and cataloguing artifacts there. The artifacts also reveal that Native Americans lived in the Great Dismal Swamp before the maroons arrived. “We’ve found tools left by Native Americans prior to the maroons. Some date back to the Early Archaic Period,” Peixotto says. She explains that the maroons found, reused, and repurposed artifacts left behind by earlier inhabitants. One example is a stone tool found at the latest site. Half of it is very ancient, but the other end has been sharpened much more recently—within the past several hundred years. “Things like this are neat because they show us the time depth of people being in this area,” Peixotto says. Peixotto’s work in the Great Dismal Swamp is funded by a group of organizations including The Explorer’s Club (Washington Group), the Archaeology Society of Virginia, WINGS WorldQuest, American University, and AU’s College of Arts and Sciences. 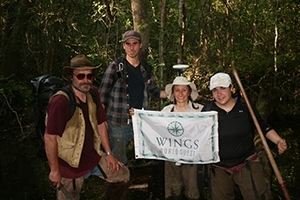 Peixotto was selected from a number of applicants to carry a WINGS WorldQuest flag on this expedition to showcase its historical and cultural significance. WINGS WorldQuest is a nonprofit organization that recognizes and supports extraordinary women in science. Peixotto says she is thankful that the organization brings attention to her work at the Swamp—raising its visibility and potential for inspiring future generations of women scientists. “I hope that my work encourages girls to follow pursuits of exploration and discovery. And I hope the general public will come to expect more women scientists and explorers in these roles,” she says. For now, Peixotto is focusing her excavation work on one small part of the Swamp. She hopes to finish her fieldwork in upcoming weeks and then shift toward data analysis and completing her dissertation. But she says that are many years of research yet to do in the Swamp. Through her blog she hopes to continue to share the story of the maroons with people beyond traditional scholarly audiences.